Provider-patient interaction and communication is very important. It doesn’t matter how old the patient is, he or she deserves to be treated with respect, dignity, and compassion. Thinking about all my appointments over the years with my various endocrinologist, I keep coming back to one particular appointment. I was probably around 13 or 14. I was having a lot of trouble with my blood sugars, my A1c was way higher than I want to admit, and I was struggling. It wasn’t that I didn’t care, I didn’t want the high blood sugars, but it was hard for me to remember to test and give insulin and my numbers reflected that. I remember I used to dread going to my endo around this time. “I’m going to the doctor to get yelled at again” I would say. My mom and I would sit in the exam room, while I anxiously awaited some lecture about what I could be doing better. At this particular appointment my doctor looked at me and started asking some strange and poignant questions. “Are you not taking your insulin on purpose?” “Are you trying to lose weight?” What? No, why would I not take my insulin on purpose? Lose weight? What are you talking about? I was so confused. I looked at my mom who was just as naive as I was. The doctor explained that some type 1 diabetics purposefully don’t take insulin in order to induce ketoacidosis and in turn, lose weight. It’s a form of an eating disorder that is called Diabulimia, although he didn’t use that term at the time to describe it, and it is very dangerous. Neither my mom nor I had any idea about Diabulimia or that people did this. While I do appreciate that my doctor was just trying to rule out this possibility for my high blood sugars, I did NOT appreciate the manner in which he did so. To me it felt very accusatory. More than that, it was as if he didn’t believe me about why I thought my blood sugars were high. An issue like that is a sensitive topic, but he did not approach it like that at all. Would I have admitted it to him if I was suffering from it? With his demeanor, probably not. When my doctor saw my confused response to his accusation, we put it behind us and moved on with the appointment. I mostly forgot about this encounter until recently when I started reading blog posts about people that have suffered with diabulimia themselves. It made me think back on this encounter and made me angry. Diabulimia is a very real eating disorder that many type 1 diabetics suffer with it, but that’s not what this post is about. I am a different person but also a different patient than I was 10 years ago, and a lot of that has come from being in the public health field (besides the fact that I’m now older). I believe that we as patients need to take an active role in our own health care. We should feel empowered to ask questions, to clarify and seek out answers, and to be treated like a human being and not just another statistic or number. Similarly, health care professionals should be working towards patient engagement and patient-centered care, to having meaningful exchanges and collaborative appointments rather than authoritative uni-directional lectures. My pediatric endocrinologist had no bedside manner. He spoke in a monotone at me, not to me. He was not very personable and really did not see me as a person struggling with control of my diabetes, but probably rather as “14 year old female, type 1 diabetic, A1c 10.0”. I should not have stayed with that doctor as long as I did, but my mom and I did not feel empowered. We were still in the early stages of dealing with this diagnosis, there were so many unknowns for us and we were told that this doctor was one of the best. Well all I know is that his approach really did not get through to me. Yes he could adjust my basal rates and carb ratios, but his recommendations only hit the surface, he wasn’t getting to the underlying issues of my high blood sugars. It honestly took years before things really clicked for me, and it was with no help from that doctor. I should have stood up for myself, even if that meant finding a new doctor that was a better fit for me and how I approach my diabetes. 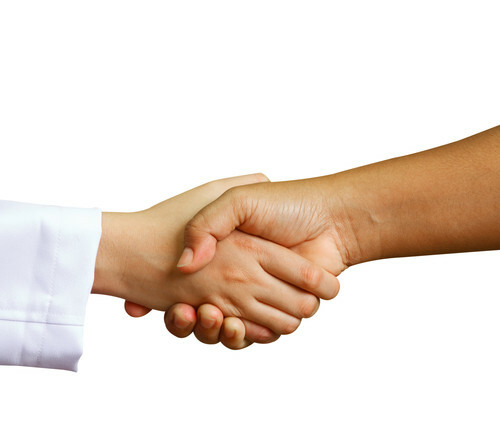 Having a positive rapport and relationship with your doctor is important. Being treated like a human being is important. You and your health are important. Everyone deserves health care professionals who understand that. I identify so much with the theme of your post. My first pediatric endocrinologist had absolutely no beside manner. He would purposely make you wait for at least an hour in the waiting room. I know it was just a waiting tactic because we would watch/overhear him making friendly chit chat with the receptionists. My other docs have been just okay and I didn't really realize it until about 2 years ago when I switched to my current doctor. I have never been more inspired in my life to take care of myself. And when things don't go perfectly he never makes me feel ashamed or like a failure. He encourages me to try harder the next time. I am moving in a couple months and am really scared that I won't find a doctor as good, but the first time I'm not willing to settle. I will keep testing out docs until I find someone who truly gets the challenges of diabetes and is willing to work with me instead of shaming me! I'm so glad you found one that inspires you instead of one who doesn't understand. It really makes a huge difference. You would think that the pediatric endos would be the ones that understand how important it is to treat patients with respect and understanding, especially the kids, but I've heard many other horror stories from other PWD. Good luck with the endo hunt! Being empowered is not easy for a conflict-averse person like me. But I've switched doctors on a couple of occasions, and I've made myself heard on two or three occasions when I really needed to. Fortunately, I feel like more and more providers are accustomed to and even appreciate patients who want to participate in their own care. Twenty years ago, my experience wasn't so good.